When thinking of adding to your current living space, you need not look any further as the solution readily lies beneath and that is your unfinished basement. A cost-effective project, it can considerably increase the value of your Suburban Chicago Home plus a whole set of added benefits for less of the cost and inconveniences. This makes a basement remodeling project a sensible investment. Learn more about other remodeling services we offer. 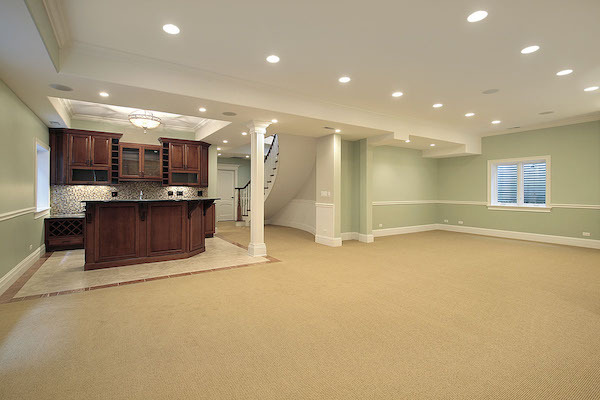 Before remodeling a basement, think about the future use of that room. A flexible space means you can change it into whatever you need it to be in the future. When you put a drop ceiling in it automatically feels cheaper. You really want your space to look like the rest of your house. A drop ceiling will also take away precious ceiling height and make the space feel much smaller. Sunny Construction recently remodeled our basement. They did an outstanding job! They are extremely professional, highly skilled , courteous, and a pleasure to work with! We are very pleased with their work! The job was completed in an extremely efficient, cost effective manner. Whenever we need their type of service in the future, we will definitely hire Sunny Construction again! It is my pleasure to strongly recommend Sunny Construction. From start to finish Rafal and entire team at Sunny Construction was a pleasure to use for our full basement remodel project. The workers were professional and friendly and cleaned up after each day. We will definitely use them for any future projects.